Fermenta is Our Home Care Caregiver of the Month! 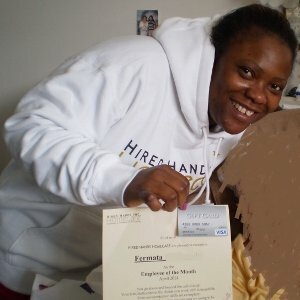 We send a whole-hearted CONGRATS to Fermata, our outstanding Caregiver of the Month for April in Marin. Fermata has been working with Mrs P for over 2 years, providing around the clock home care and has done an AMAZING job. Her attention to detail in caring for Mrs. P is exemplary! We are proud to have worked with Fermata for over 3 years now, as she has shined from day one. Fermata – a huge thanks for all you do! Fermata has a can do attitude with a contagious smile on her face. The picture says it all!! Thank you Fermata! !